It was early April and our second match of the spring season. We were playing at Western Michigan University vs. their B side. We had gone up early in the match and hadn’t let back at all. The second half had started and a few minutes in we were pinned deep inside our 22 meter line. A turnover had occurred and we had gotten the ball back. The scrum half proceeded to pass me the ball for a clearance kick. As I was chasing my kick downfield the opposing fullback picked it up and went to put a move on me, as he put his move on my ankle didn’t follow my body and I would collapse hearing a snap (still making the tackle as well). I would proceed to get up and continue playing but as I went to stand up I could not carry any weight on my right leg. A few minutes later with me laying on the ground play would stop and I would be carried off the field. I hadn’t felt much pain yet as my adrenaline was still going. The trainer had though I just sprained it. I would spend the rest of the match lying on the sidelines as my team sealed off a victory. We would head home back to Oakland after the match stopping at a restaurant on the way home. At this point I still wasn’t in much pain but could not put any weight on my leg. My best friend who was also on the team had to carry me over his shoulders into the restaurant. During the rest of our trip home my ankle began to swell quite a bit and the pain became tremendously worse. The second we got back I was taken to the ER for X-Rays. They came back and they showed I had broke my ankle in 2 spots and would need surgery to be able to play again. A few weeks later I would have surgery and wake up with a plate and 7 screws in my leg. After a few months of physical therapy three days a week. I would return to the field for a 7s tournament in Grand Rapids. I would play pretty well, but it was my clear my fitness was not up to rugby standards let alone 7s standards! I would continue training and a little physical therapy until the fall season of 15s started. That fall I would have my best season of rugby yet. Scoring 5 tries in our first two matches and finishing off the season leading the team in tries scored. It didn’t take me long to return to the field as I had missed playing so much. I think the worst thing about it all wasn’t me breaking my leg or having surgery. 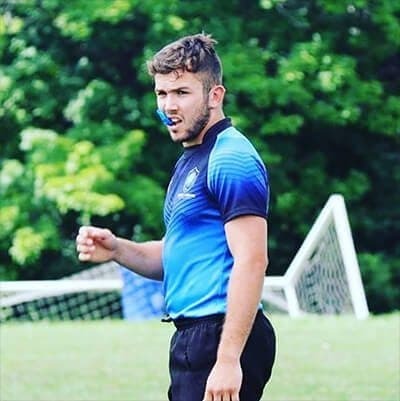 It was the fact that I had to sit out the majority of the spring season (which included playing at Notre Dame on their beautiful pitch) and most of the summer 7s season. Sitting on the sidelines knowing you can’t help your team on the field is the worst feeling ever.